I am really excited that for 2016 I am working with Simon, a member of the leadership team at my church, on a year long weekly Bible Study. It starts on Wednesday 6th January 2016 but you can find out more today on the special blog we have set up: Glimpses of Jesus in the Old Testament. 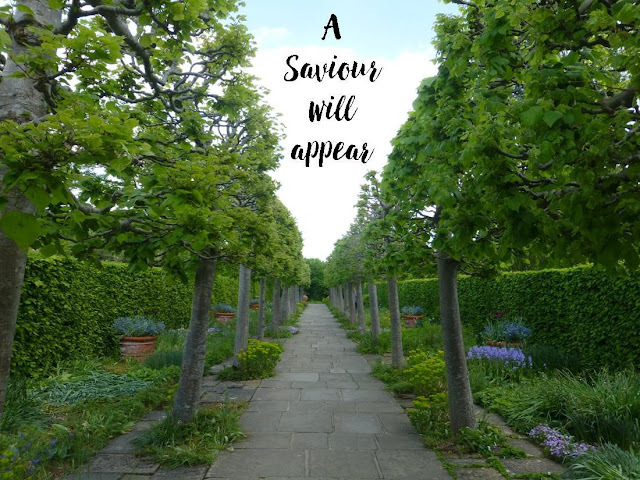 I have been hosting art challenge blogs and creative Bible studies for a while but this is my first foray into a year long, weekly Bible Study. Each week there will be a short passage written by Simon which includes suggested further reading. There will be a 'To think about' suggestion for people to think about or to journal about. Whenever possible there will be a worship video and some creative responses from members of Jubilee Church. Here's a sneak peek at some of the artwork. I hope you will join me in this exciting new adventure. I have talked about colour theory and the start of my colour theory journal. 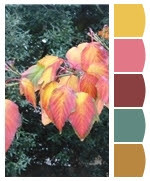 Today I'm going to show the work I have been doing in the colour journal. However first I wanted to share this post with you: My Unique Colour Story. This was a class I did at The Festival of Quilts last year and had forgotten about until I was looking for some photos for another blog post. Today's post is a bit disjointed - sorry. I feel like I'm just throwing bits at the page but I hope it will be helpful. An interesting blog post I found Expressing with colour and another series of really good blog posts on colour theory. And here's my Pinterest board. And now back to my colour theory journal. I have used different makes of paint which has worked better than I thought. 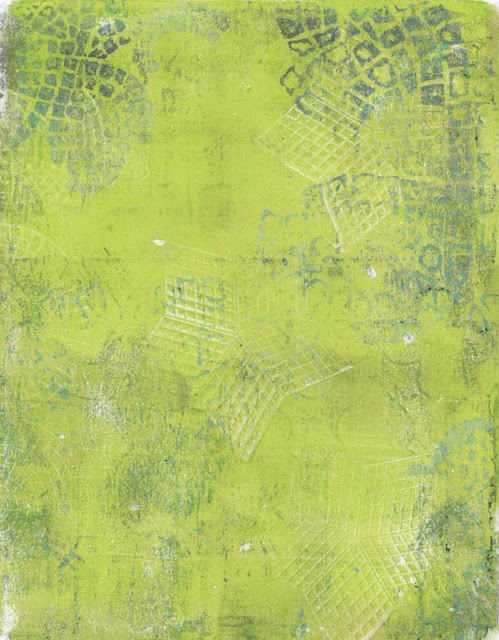 In the online class Pam Carriker suggests only using one make of paint but doing several of these journals for all the different paint makes that you have. I probably won't ever do that but I may try it with my Inktense crayons and bars. Still lots of space to fill and colour wheels to complete. I bought the class as an online video but I have just found a companion guide that is downloadable. Thank you so much for reading my blog over the past year. 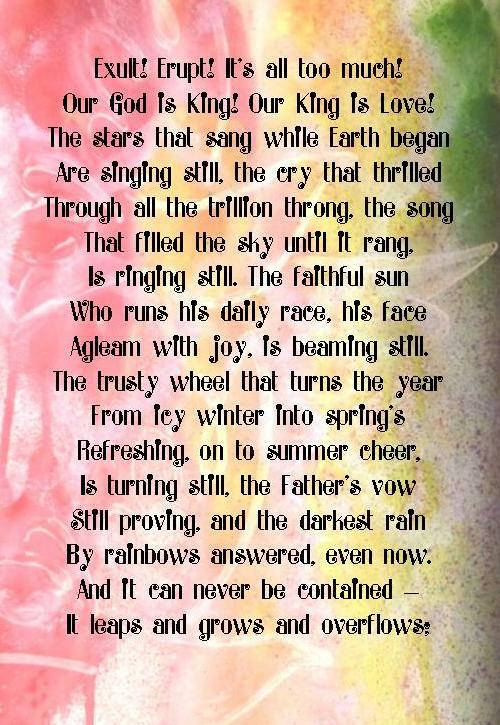 Today I am sharing a poem I wrote some years ago. Keep guard from ten to dawn. From predators - meat starved in winter. Who share my troubles and the cold. So cold it was, high on the hill. White houses clutching the hillside. Or the chill of the night watch. Not old and wizened as today. A stable carved from the rocky hill. The light beckoned, called us forth. Sounding a hymn of praise. Not knowing why, or who he was. And returned to our flocks rejoicing. And yet it seems like yesterday. What happened to the boy I wonder? Or a poor shepherd, like me? What have you signed up to do in 2016? 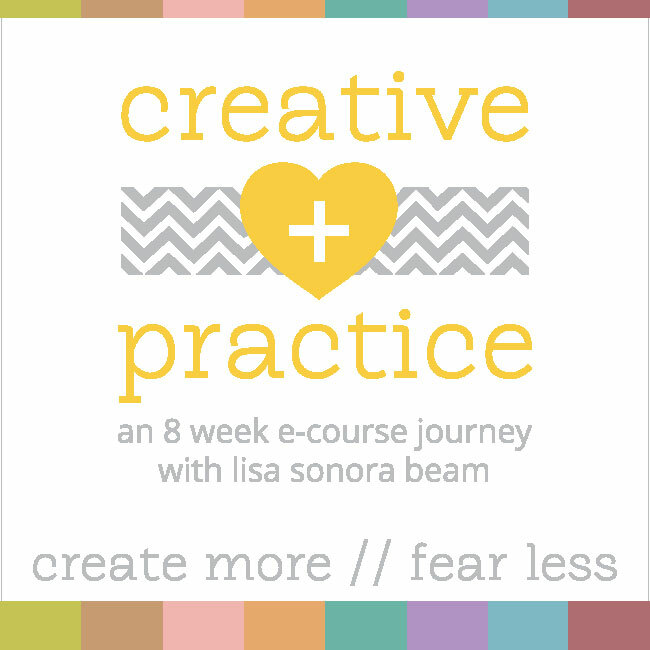 I am currently doing a class called Creative+Practice and today is the start of week 6 of 8 weeks and I am totally up to date. At the beginning of the class we were asked to write our intentions for the class and I wrote 'I intend to finish the class'. I'm patting myself on the back that I have got this far - I've got beyond the point where I normally give up. So maybe that's the key thing when starting a new online class - commit to finishing it! Sometimes with me it's even the case that I need to commit to starting it. Currently I have signed up to do several classes in 2016 but maybe I'll just hold a watching brief over some of them and do my own thing rather than follow slavishly along and then feel bad when I fall by the wayside. So what is on offer? There's Take Me Deeper-DNA and Logos365 on His Kingdom Come. Both of these are free and I will probably amalgamate them with other things that I might do. Fortnightly on TMD-DNA there is a technique prompt and an I Am statement which I hope to play along with. (For my US readers - fortnight means 2 weeks). In January I am planning to follow a free bible study and a short art journaling course from Jeanne Oliver. The Bible study, Listening:Finding the Quiet, is a four week study all about finding the quiet in each day and hearing the voice of God. 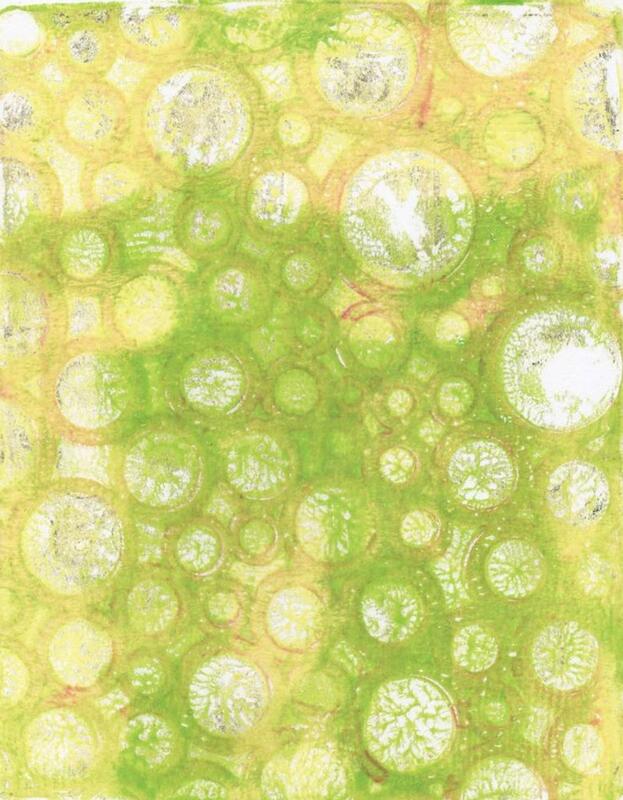 The art journaling course, Reflections, is a 'two week art journaling online course all about unraveling your own story and creating authentic art that only you can tell'. Fortunately the art journaling class starts the week after Creative+Practice finishes. Also in January I've signed up for Creative Jumpstart. This isn't really a class as such. There are 25 downloadable videos with various teachers showing techniques. You can keep the videos as a reference library for when you are stuck for an idea. So that brings me to the year long classes or workshops that I've signed up for. 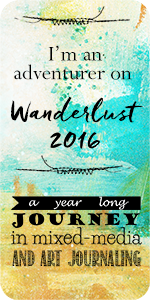 I really like learning techniques and learning about different products so Wanderlust was a must for me. 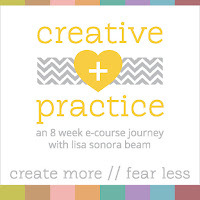 One Little Word is a monthly class from Ali Edwards which I have done in previous years and will probably combine with Logos365. I'm going to dip in and out of Documented Life Project - the unplanner. I enjoyed parts of Documented Life Project in 2014 especially the fact that I combined my one little word with it. 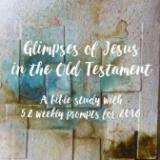 And finally starting on January 6th, there's Glimpses of Jesus in the Old Testament - a Bible Study that I am working on with Simon Clay from Jubilee Church. This is a free weekly bible study with optional creative responses. Have I taken on too much? Probably. Will I complete it all? Possibly not. Will I enjoy it? Definitely. What have you committed to doing in 2016? I wrote the prompts for the Advent Study at His Kingdom Come for December 17th and today. This is the art work I did for it. Why not check out His Kingdom Come? There are big plans for Take Me Deeper in 2016. Take Me Deeper-DNA™ is a free weekly journey at His Kingdom Come beginning Friday, January 1 2016. Take Me Deeper-DNA™ is a bi-weekly devotional that will prompt us to spend time in God's word. Each devotional week you will get the opportunity to translate the bible study into art. Every Friday HKC will post a verse, devotional, worship video and examples of how we interpreted the bible study in our art. The weeks that do not have a devotion, a "creative prompt" will be provided by a guest artist. The creative prompt will be based on an "I am" statement that will help us go deeper in finding out our "DNA" in Christ. It is free to join the His Kingdom Come community. Sign up here and then Join the TMD study. Continuing the Venice project Cas Holmes style! I went through the previous afternoon's exercise which resulted in this. Once the workshop had got going Cas suggested I traced over the image and cut myself a mask. 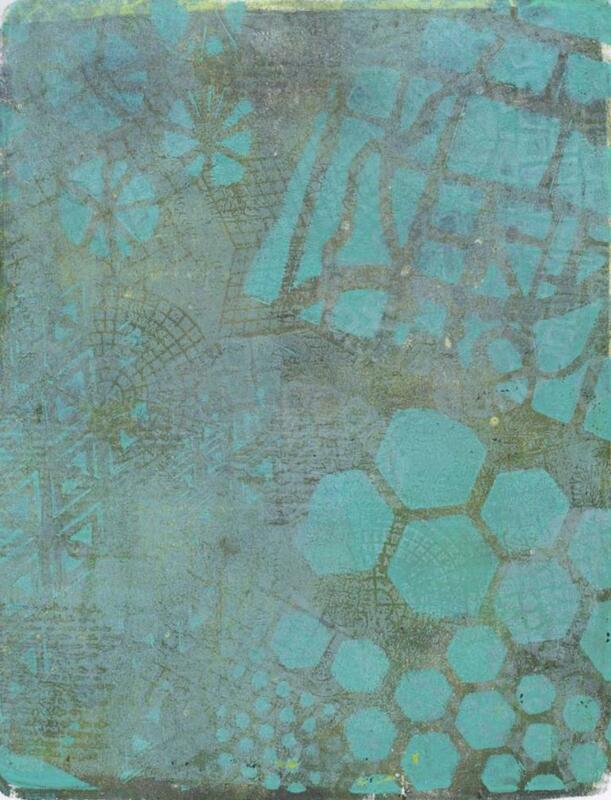 I glued the tracing to a piece of tracing paper that I had already used on the gelli plate and ended up with this. I put it on some thin cotton fabric and printed with some lace and brushed some paint off the mask onto the fabric. Cas had shown us how to print with found objects and had given us some lace to print with. The pattern on the lace on the right reminded me of the brickwork pattern on the Doges Palace in Venice. We printed on a variety of surfaces and in the afternoon Cas showed us how to collage these together with paste. We needed to let these dry over night. I also pasted a collage into my sketchbook. 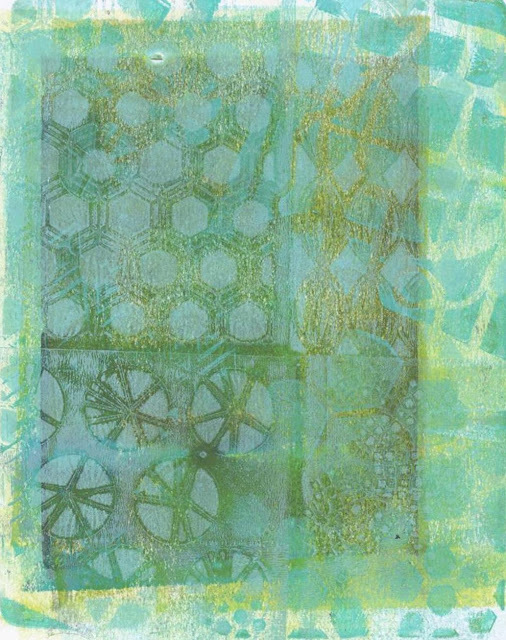 I had taken with me some of my gelli prints. We also collaged a piece by pinning the pieces so that we could stitch into them during the drying time of the other pieces. This is upside down while I was working into it. On Sunday we continued working into our pieces. This was a narrow piece drying. I borrowed a machine to add covers to a book I decide to make. I used a gelli print I had done on black paper to make the covers. I continued to work into the other pieces during the day ending up with this collection of work. I love this piece that looks like a remnant. I'm excited to see where all this leads. I spent the weekend at a Stitch Retreat organised by the amazing Nichola. The workshop I was on was taught by the fabulous Cas Holmes and was called Edgelands:Layers, Stitch and Marks. I usually go to workshops on my own and unless it's at Art from the Heart I don't know anyone at the workshop. This leads to some anxiety on my part on the way there and a stern talking to myself about being friendly and talking to people. The ladies on the course were all friendly and the three ladies at my table were really lovely and shared ideas. The workshop started at 4pm on Friday afternoon. And it started with what I hate most. Drawing! Yet another stern talking to myself inside my head about not bursting in to tears or walking out! Cas took us through the drawing exercise and then we had to give our drawing to someone else. At this point I was screaming inside - draw in someone else's book! Have someone draw in my sketchbook!!!! Arrggh! Anyway after I had come down from these thoughts it turned out we were tracing over the person's drawing. Phew! And then we had our sketchbooks back and incorporated the other person's drawing into our own page. My drawing is on the right. I wanted to be able to work on my Venice theme rather than nature based topics. Cas suggested that for my 'homework' I should use the same drawing exercise but use a piece of Venice source material. I had this with me. So later, after a large glass of wine!, I drew this. The point of the exercise was to start drawing and not lift your pen off the paper until you had got to the end! Tomorrow on my weekly Venice project blog post I'll show you what happened with this. The whole weekend was great. Once I calmed down from the drawing exercise and saw how Cas worked I had such a lovely time. Doing the exercise was one way to get us to not be so 'precious' about what we produce and helped Cas to see how we worked and how to adjust her teaching plan to the makeup of the group. Brilliant. Over the rest of the weekend Cas shared her processes and demonstrated some techniques. The rest of the time we worked on our own projects and Cas went round suggesting ideas or asking us questions. Despite a full on weekend I came home really energised about my Venice project and how I can move forward with it. My really bright light-bulb moment was sometime on Saturday when I realised that my artwork didn't have to be a true representation of my Venice photos but that it could be a reflection of those things that attract me in the architecture. You can find out more about Cas' work and her processes in her books The Found Object and Stitch Stories. The Advent Study on His Kingdom Come is based on a worship song each day. Each of the authors of the prompts has written their response to the song. And from this I am making a half journal page as my creative response. This is a much simpler response than the Advent calendar I made last year. Rather than share these each day I am going to share a weekly round up of the song and my response. Here's what the six responses look like across the journal and the added page. Next week will bring new songs and new responses. 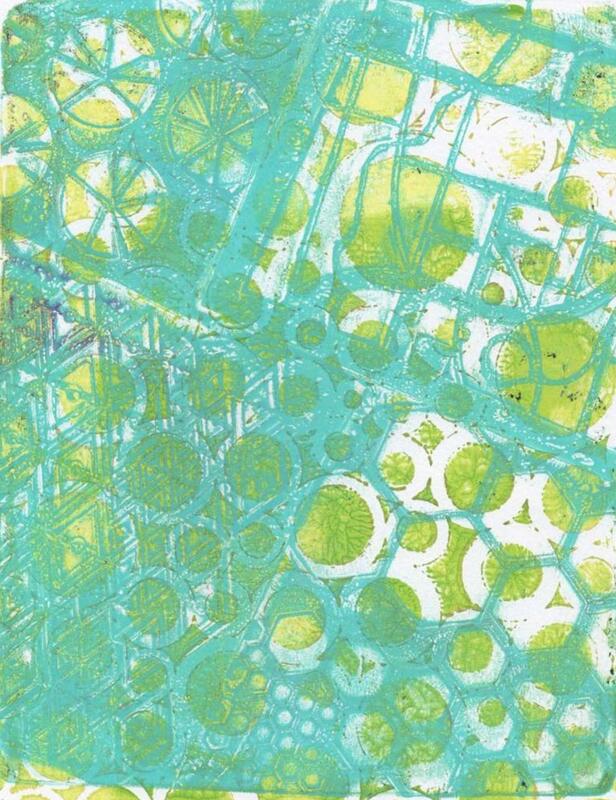 Recently I took part in a Gelli Print swap in a group I belong to on Facebook: Gelatin Printing Enthusiasts. We were asked to swap up to a maximum of 10 gelli prints. I was paired with a lady in Bulgaria. I decided that I would make a set of 10 prints in a series. I sorted out three 12"x12" stencils, six 9"x12" stencils and six 6"x6" stencils. I found a couple of plastic canvas shapes and limited myself to a colour palette. I scanned them into my computer so that I could print them out and use them too. 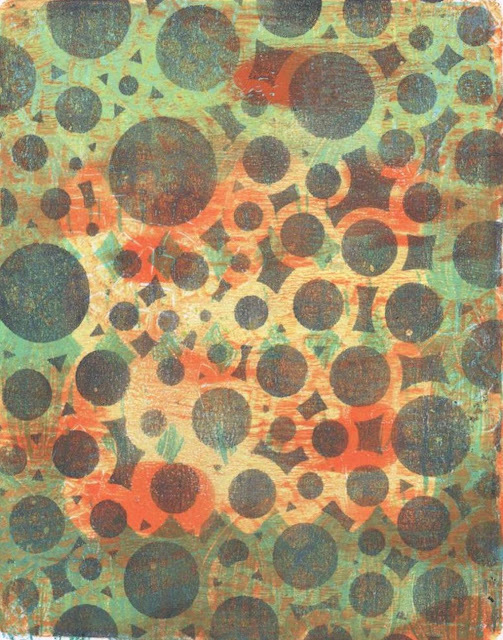 And the best thing about Gelli prints is that if Irena doesn't like any of them she can always print over the top. Yeah! Last week you may remember in my post about my Venice project that I mentioned that I had been distracted by an article by Michelle Ward in the latest Somerset Studio magazine. I couldn't work out from the magazine what size the paper was that Michelle used so I decided to use 9"x72 for each section. (I've since found out it was 10"x7"). I didn't have one sheet of paper large enough so I cut two pieces of mixed media paper making sure one had an extra half inch to join to the other piece. I started by using a technique I learned from Seth Apter. I painted the 2 pieces of paper with acrylic paint. One in blue and one in the sandy pink colour. Then I realised I needed a third piece of paper so I quickly painted another shade of the pink on a spare piece of paper. Then I pressed one sheet onto each of the others. 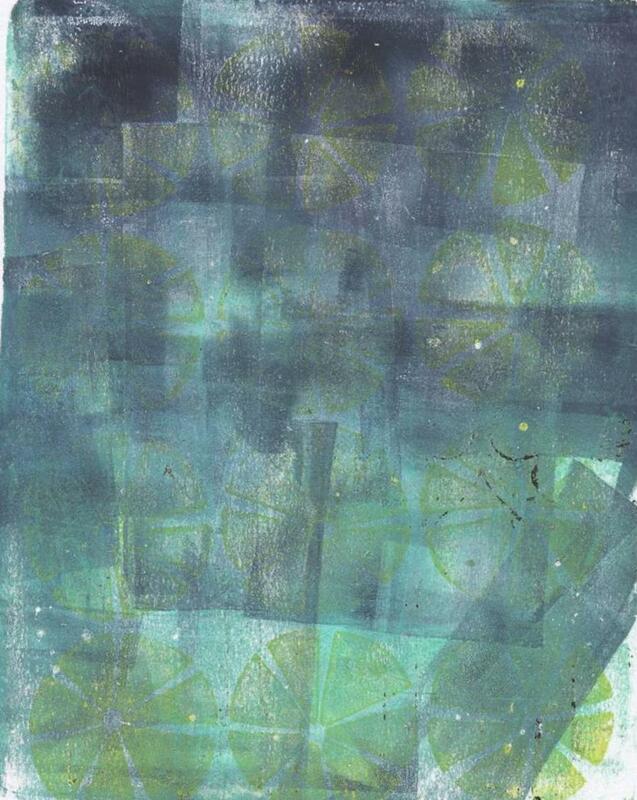 The other colour monoprints on top of the other. This was the spare sheet of mixed media paper. It would have been better if I had painted the spare in blue rather than the cut piece as this came out very blue. Consequently I cut the spare piece into the size I needed for the zigzag book. 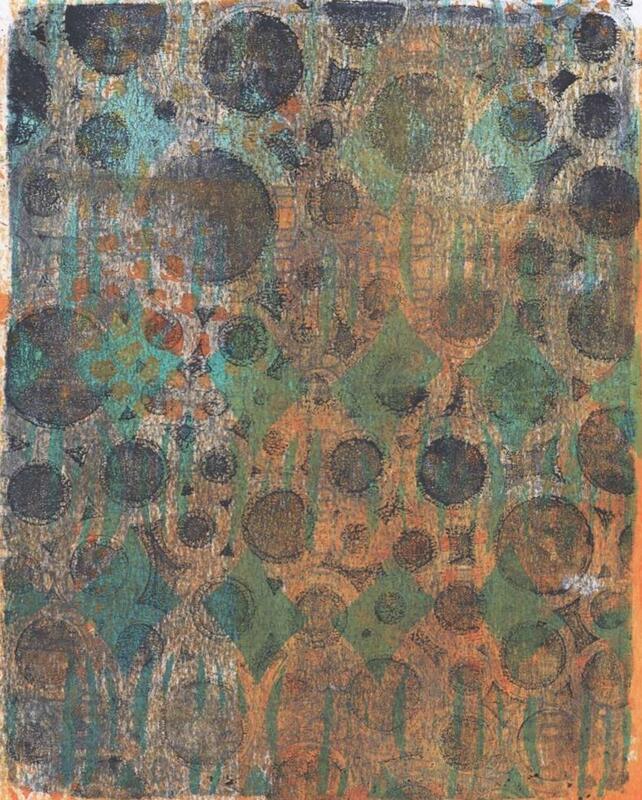 What I loved about this technique was that it left a texture on the papers that feels like brick. I thought I might have to sand it back where I wanted to glue paper but it was okay. I cut the apertures and started on adding bits and pieces. 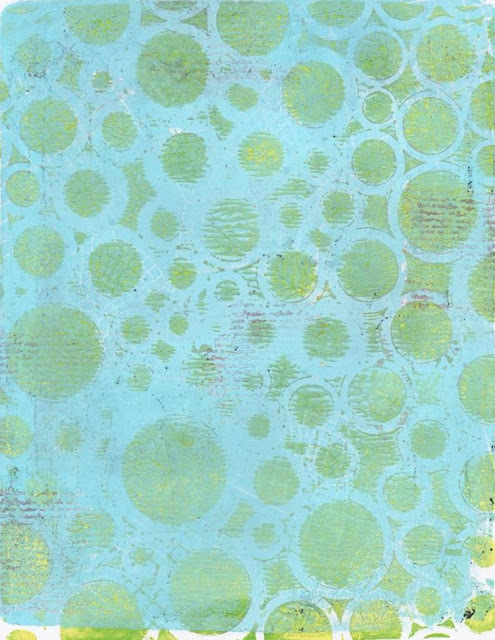 In the photo above I printed out different sizes of my gelli prints onto scrapbook cardstock. I also printed the stencils onto Repair Tissue and used this and some of the gelli prints. 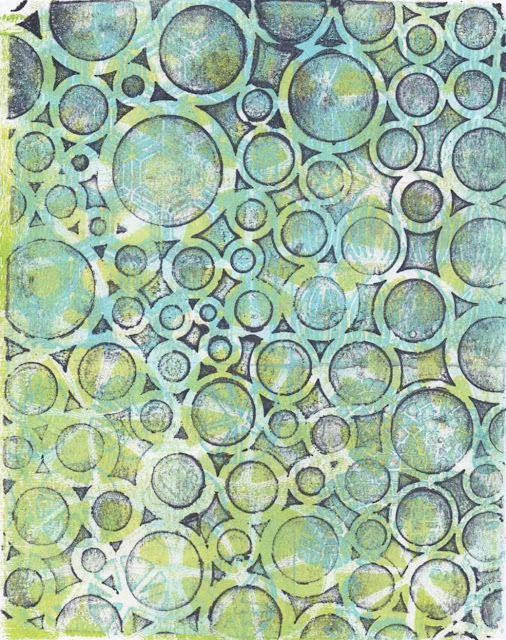 I used stencils and stamps with Distress Inks on the background and continued to add bits cut from the gelli prints. I inked around the edges of the book. And then stuck the two pieces together. The photos don't really do it justice. I am really thrilled with the outcome.